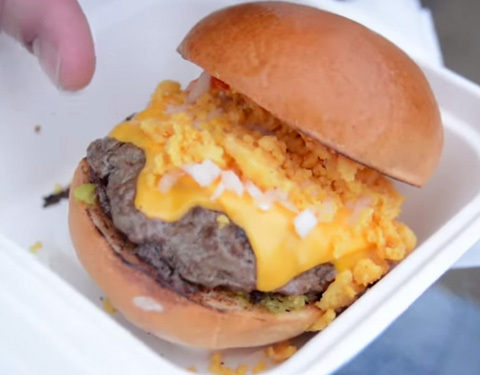 In honor of England’s National Burger Day, London-based Burger Gang heads to Battersea’s Power Station Pop-Up Park, where a hamburger celebration is underway. Burger Gang host Lewis Richards wears a custom-made “Burger Gang Or Die” vest and a burger pin on his lapel. The guy’s love of all things burger is really next level. Over at Club Gascon, Lewis dines on Pascal Aussignac’s specialty foie gras burger (and flubs the name at least twice). He calls the creation “wifey material” for being so rich and French. Sounds like every single food festival ever. While he admits that his burger-fueled diet has caused some “size alterations…and I’m not getting any taller,” we can’t help but be jealous.